Most of Friday was spent at Rebecca and Will’s house hanging out with toms family. The adults lounged around while the kids played. 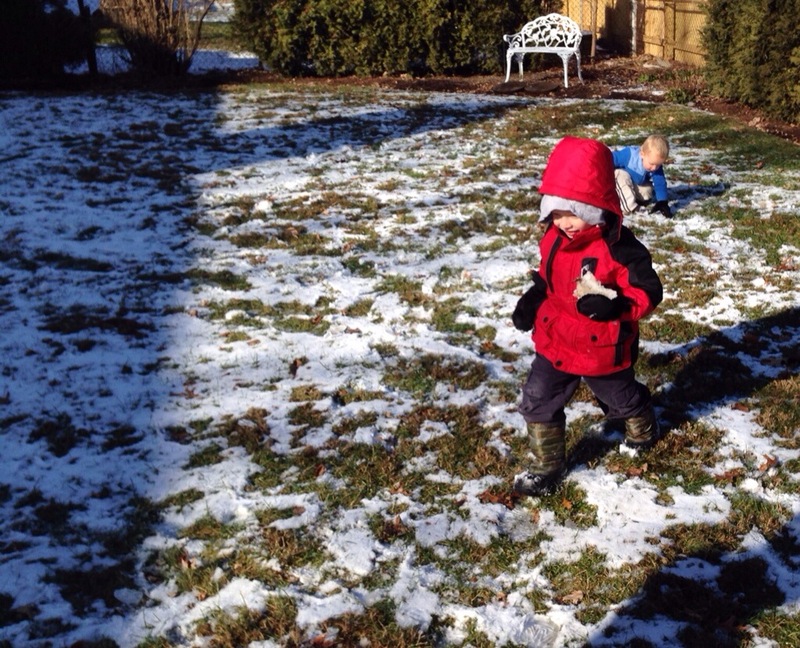 This year there was a small amount of snow on the ground so our kids were able to throw snowballs at us. Charlotte rarely gets any snow so even a dusting is exciting. That evening some of us went to Hershey Park to Candy Lane. Part of Hershey Park is open for kids and families. Most of the rides are for kids 12 and under. 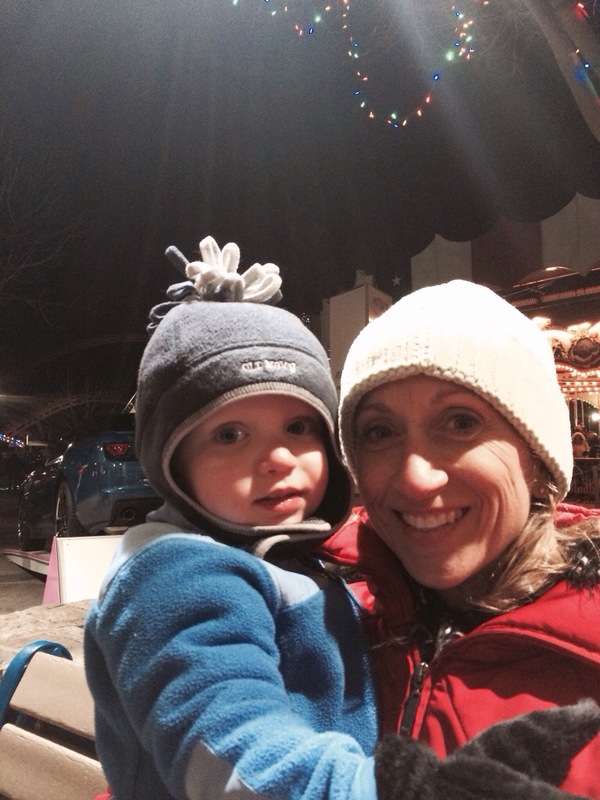 Even though it was only 32 degrees out we braved the cold for a little outdoor fun! We all lasted about two hours before we could take the cold no longer. This entry was posted in Uncategorized on December 29, 2013 by Becca. We had Christmas #2 on Saturday morning at Rebecca and Will’s house. Both of Tom’s sisters were there with their boyfriends and children. Otis always fun. The kids get lots of fun presents. I think the big hit (literally) this year was the hulk hands that Wilson received. He sparred many times all afternoon. He was pretty self controlled, all things considered. After the presents were all opened we played, rested and snacked until dinner. My favorite snack each year is the giant pot of Chex mix that Rebecca makes. Yum! Everyone just scoops a bowl of it as desired. It was a fun and relaxing day. We only get to see Toms family a few times a year so it was nice to see everyone together. 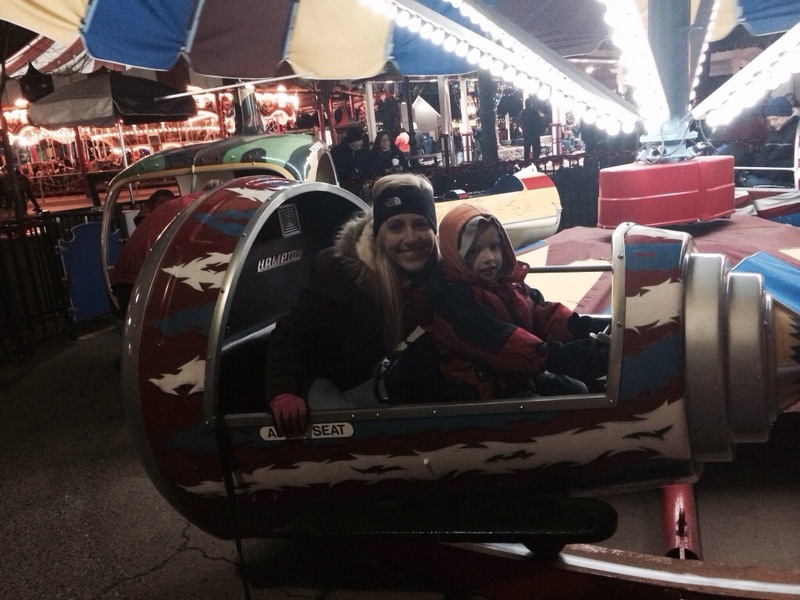 This entry was posted in Uncategorized and tagged christmas, mechanicsburg, pa on December 28, 2013 by Becca. Today we drove up to Pennsylvania to see Tom’s family. 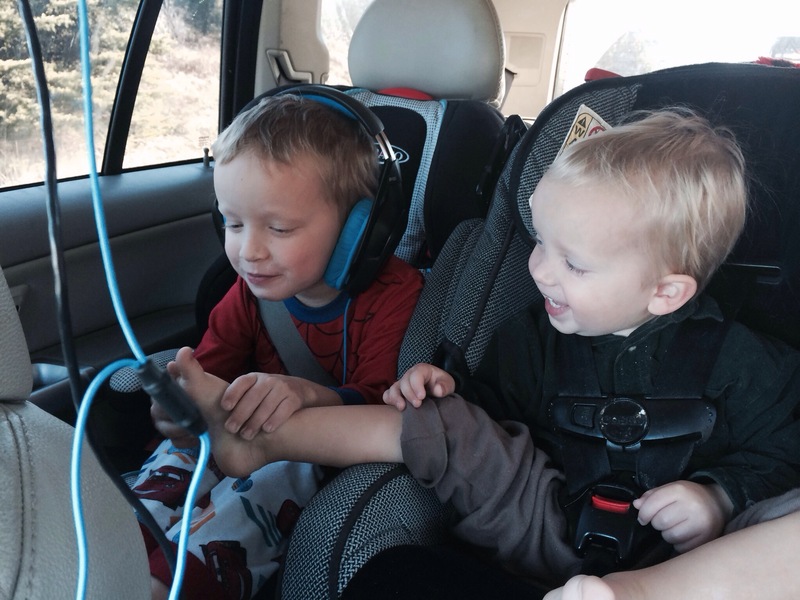 We had packeted the night before so all we had to do was get three kids in the car with their blankets and shoes. (I think we forgot Miller’s shoes). About two hours into the trip I decided that it was time to take a nap. I might have had my eyed closed for two minutes when I jolted up because tom was slamming on the brakes. He tried to stop, luckily the car in front of us slid to the side and we stopped without hitting it. However, the guy behind us wasn’t so lucky. He slammed into the back of us. We were a part of a multi car pile up on the highway. Thankfully none of us were hurt and our car was still drivable. It also delayed our trip by two hours. 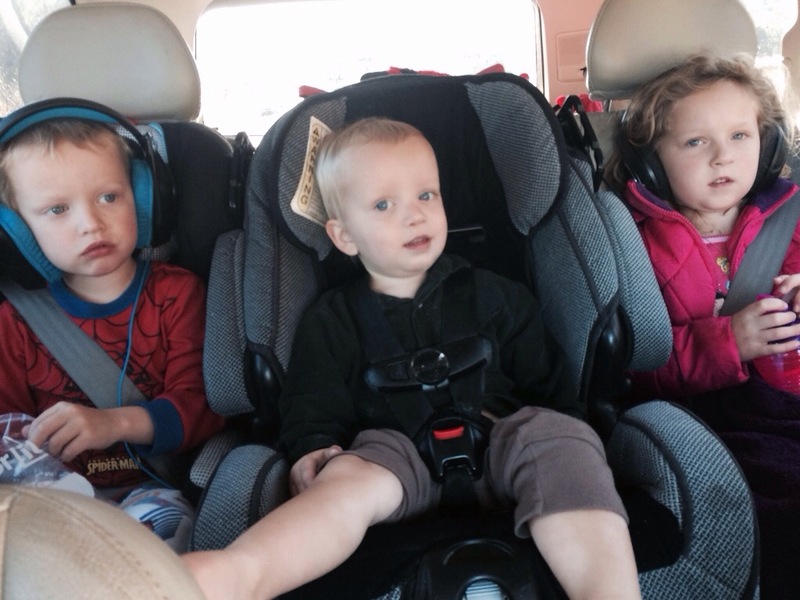 The kids did great and sat in the car for two hours while we waited for the police report. Then we were finally on our way. So eleven hours, one accident, one lunch stop, three bathroom breaks, and many coffees later- we made it to Harrisburg, PA. The hotel we are staying in is awesome! Tom had racked up enough points at the Sheraton for us to stay for free for four nights and to be upgraded to the suite. The kids were psyched to have a hotel room with a couch and a pool. Believe it or not but they had never seen a sofa bed before! Can you believe that? It is the little things in life. 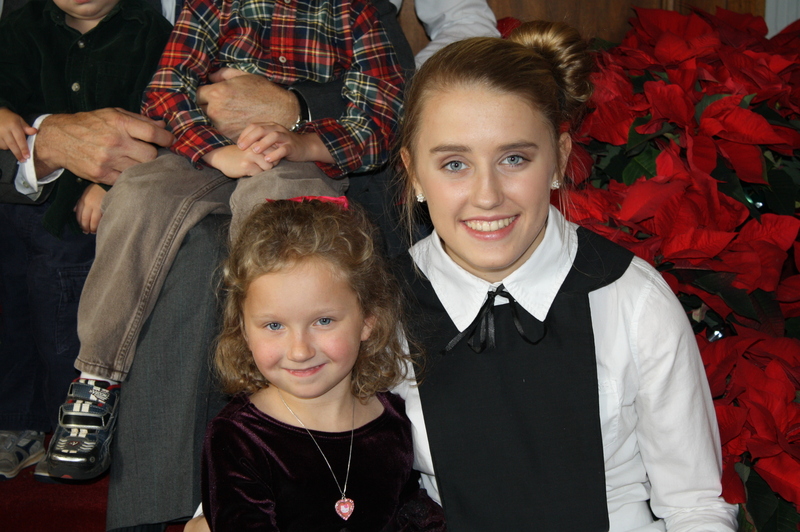 This entry was posted in Uncategorized and tagged accident, harrisburg, hotel, pa, sheraton on December 26, 2013 by Becca. We were up early….6:30am. Faith and Wilson came in early to wake us up. They waited a little while in bed with us but were not willing to wait very long. They wanted to get their gifts. Miller was still asleep so we told them that they could open their stocking and see what was in there first. Tom told me that when he was little their stockings were hung on their door knobs Christmas morning and that they could open those up in their rooms. At first I was not keen on this idea because it was not what we did, but this year I saw the value in it. The kids can play in the rooms for another hour or so with the stuff in the their stockings and then they won’t wake us up as early. Brilliant!! Next year, the stockings are going on the door knobs. A present tradition that I heard about and instituted last year was that the kids only get three gifts from us. If Jesus only got three gifts, then they can get three gifts. It really takes the pressure off of me and it makes everything very fair…at least for now. Maybe when they get older it will change, but I doubt it. I love that rule! Faith even knows it well because yesterday she told me that she had four gifts….in my mind, one of them didn’t really count. 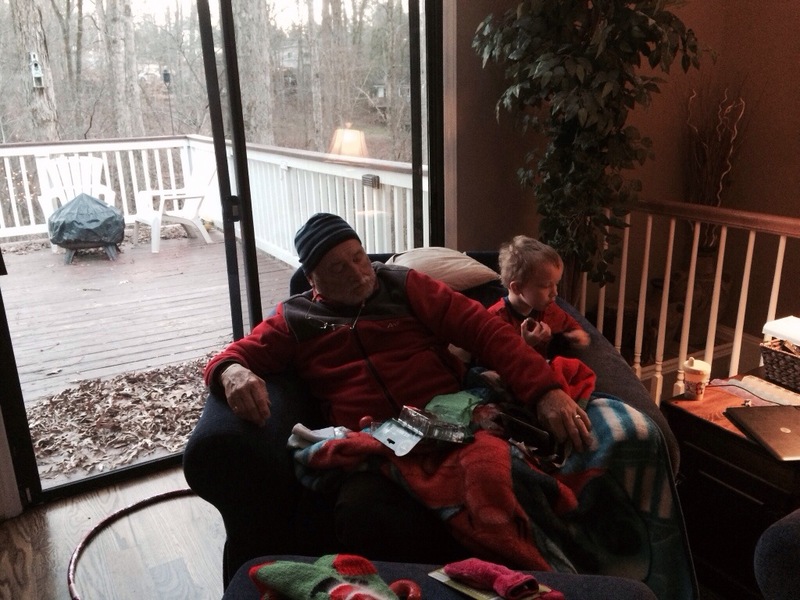 ANYWAY….we opened the stockings and waited for Miller to wake up. He finally did and the present opening began. Miller’s big gift was a play kitchen. Faith got roller skates and drawing stencils. Wilson got a toy gun and Star Wars sheets (they are really cool, for sheets). By 9:00 my parents were over here with Grandmama and many more gifts. Miller didn’t know what to do!! The best part about living in Charlotte is that I have so much family living here. After presents we all went over to Aunt Lisa’s house for breakfast. We stayed there for over three hours and I think that they practically had to kick us out. We finally got home to our mess of a house. Paper and toys were everywhere. It was a good mess though. We all had a great day together: playing, socializing, giving gifts. At the end of the day Miller kept having me light a scented candle so that he could sing Happy Birthday to Jesus and then blow out the candles. I wish I had gotten a picture of it. Faith and Wilson even joined in for a few rounds. Happy Birthday, Jesus! This entry was posted in Uncategorized on December 25, 2013 by Becca. 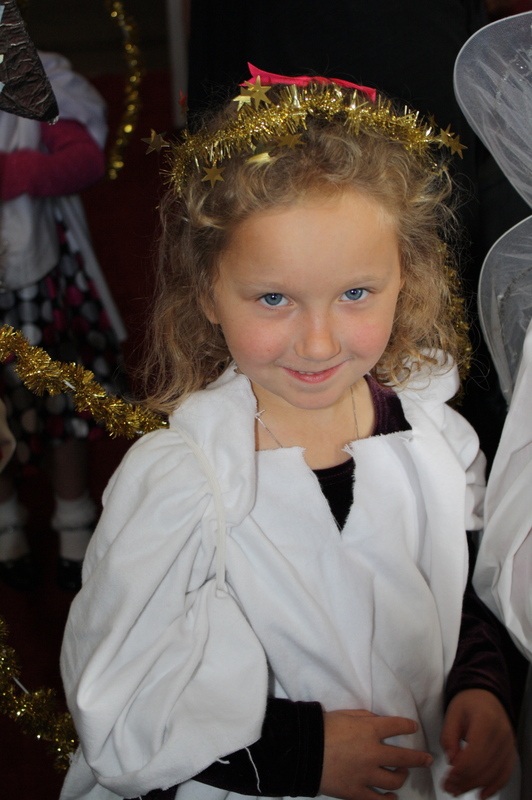 Faith as an angel in the play at the children’s service…. 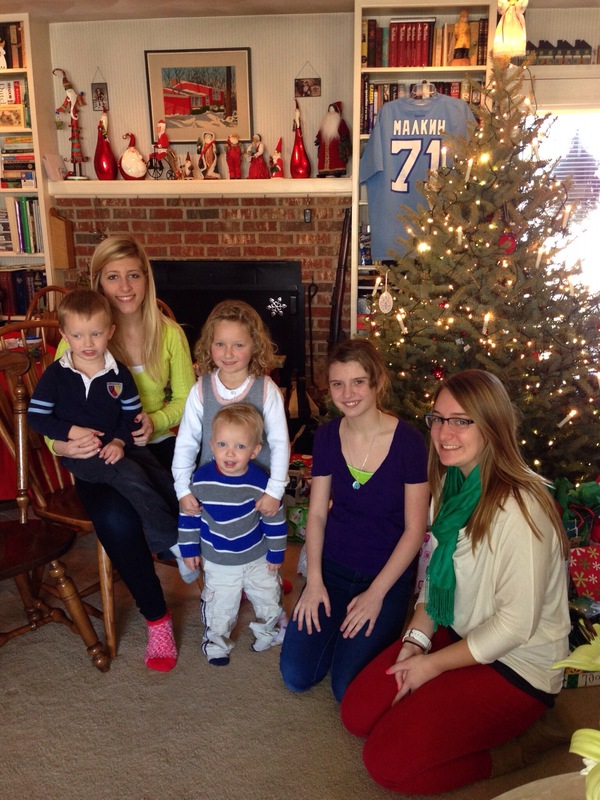 Our family picture by the tree…. 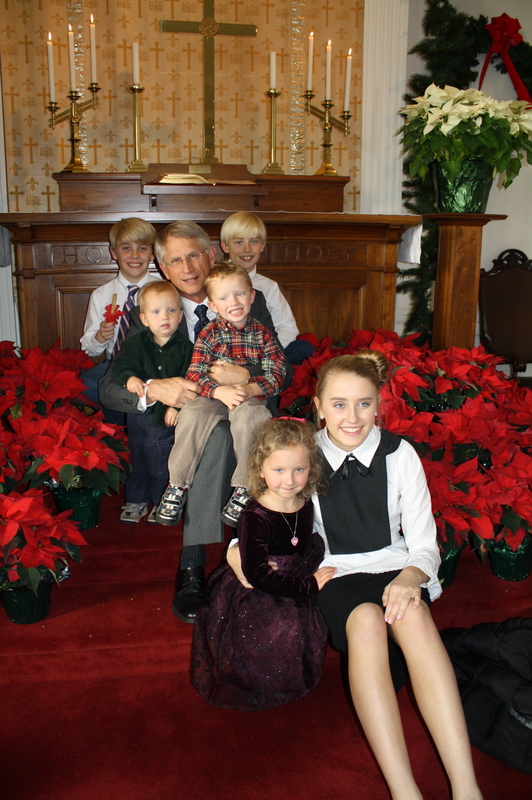 My dad with all of the kids…. Christmas Eve doesn’t change much for us each year. Tom’s dad is in town with us for Christmas. We go to the 2:00pm Lovefeast service at Little Church. 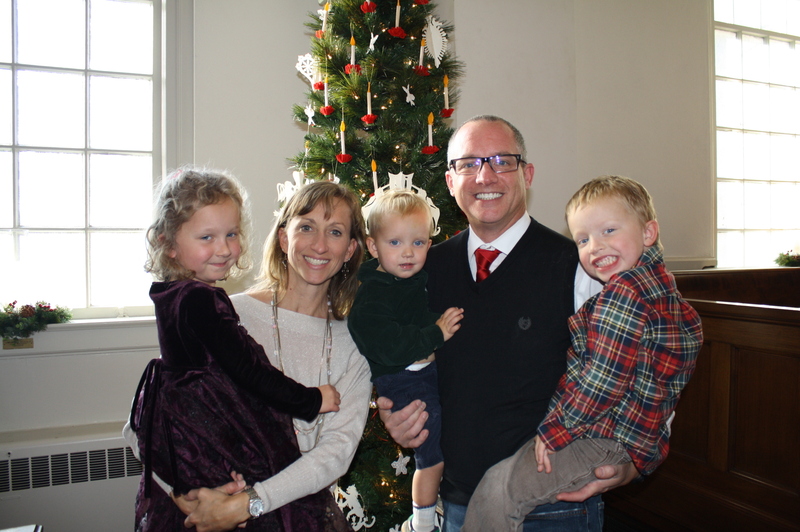 We always get our picture taken by the Christmas tree at church. My dad takes a picture with all of the kids. 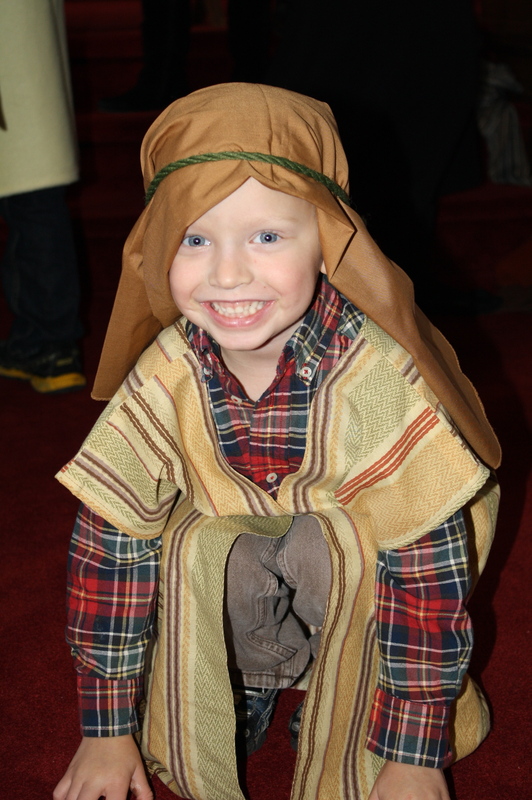 Tom is at the church almost all day, and the kids go to bed excited. The difference this year is that we are pretending that Santa is real. I typically do not include Santa in the Christmas celebration. The kids know that he isn’t real and that he is just a pretend character like Cinderella or Buzz Lightyear. I can’t lie to them. I also don’t want them to think that God isn’t real either when they find out that Santa isn’t real. However, no matter how many times they ask, and I tell them, that Santa is not real, they want to believe it. So per request of the kids, we are putting reindeer food in the drive way and leaving cookies out for Santa. It is fun to pretend now that I know that it is all for fun and we are all pretending together. We even watched the “Santa Tracker” on the internet to see if he was getting close to North Carolina. Christmas Eve is exciting for everyone, kids and adults alike. I am excited to give the gifts to the kids and they are excited to get the gifts. At 10:00 tonight we had a couple of cars pull into the drive way so the adults could exchange the kids’ gifts. I had the Youngs’ bikes hidden under my house and my parents had Miller’s play kitchen at theirs. Everyone met in the driveway to get the gifts to the right house. Even that was fun!! This entry was posted in Uncategorized on December 24, 2013 by Becca. I am great at buying Groupons because I love a good deal. However, I am not so great at using them. Most of the time I am forced to use it the week before it expires. That is exactly what happened today. A few months ago I bought a Groupon for five roller skate rentals plus five hotdogs and drinks for $10. What a deal! I had to use it today because it expired the day after Christmas. Fortunately for us, it was perfect timing. No one was at the rink today. 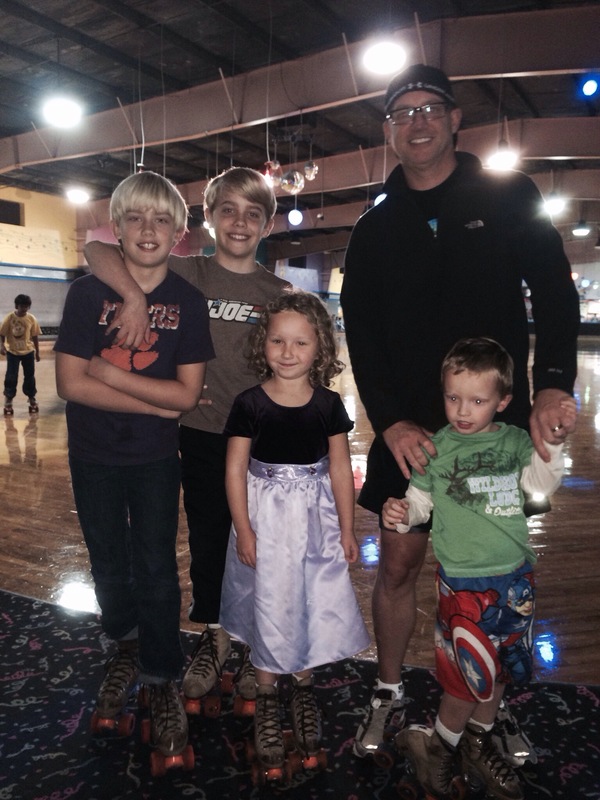 Tom and I took Wilson, Faith, Will and John to Kate Skate in Indian Trail, NC. Wilson and Faith had never been before. I was hoping that Faith would really like it since I had already bought her roller skates for Christmas. 1. Wear very hard shoes when trying to teach a child to roller skate. And I mean “hard”. Not sneakers and definitely not Toms (which I had on). My feet got kicked and rolled over numerous time. Roller skates are very heavy and very hard. 2. Rent one of the rolling metal crutches for the new skater. Brilliant!! Ever seen one of these bad boys? A metal rolling walker that the kid pushes on his own. We didn’t have to do anything, especially get kicked, rolled over or have our arms hurt because we were holding him up. Wilson did much better on his own anyway. It was amazing! He loved to go fast. He skated all over the place. I was so proud of him. He isn’t usually one to continue to try something over and over until he gets it, like Faith does. Faith is very determined to succeed at almost everything she tries. Wilson usually gets bored and moves on to something else. Not today! He said that his favorite part of the day “was going fast”. Of course it was! This is Wilson we are talking about! Faith was doing pretty well on her own. She could stay up and basically walk around the rink. I didn’t realize until the end of the day that her wheels had been tightened to the point that they barely rolled. This was helpful. Wilson’s were loose and moved quite freely. This was a terrible thing when he was holding on to our arms. This was a fantastic thing once he got a “walker”. 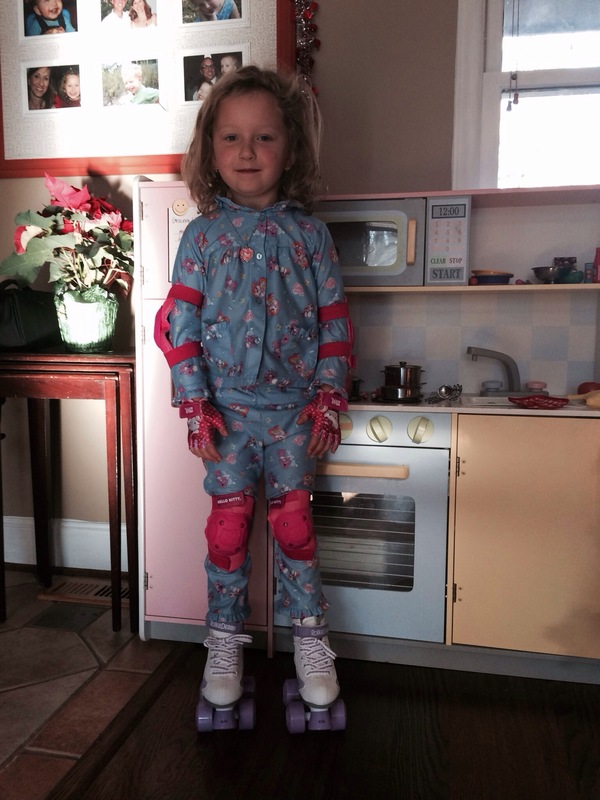 Now, did Faith enjoy rollerskating enough to want them for Christmas? I have no idea. I think she will be excited but also a little nervous to try them at home. I hope that she loves to roller skate as much as I did as a child. I don’t remember every having trouble learning to skate, but I know that I loved skating. We will find out the answer to this question in two days. What I thought was going to be a very short trip to the roller skating rink ended up being an almost three hour stop. The kids had a blast. Once again, we had a great time doing something new together. Will and John even slowed down to take a few laps with Faith – which was probably her favorite part of the day. They are her heroes! 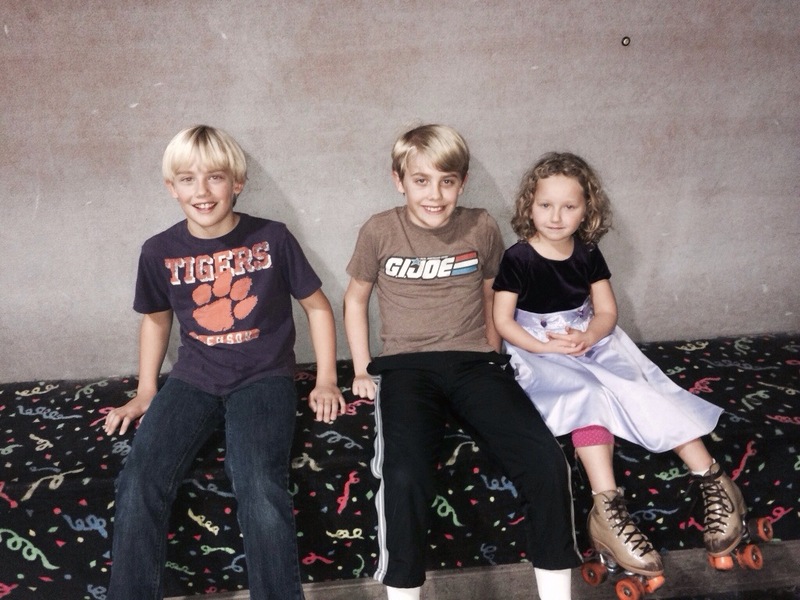 Here is the gang getting ready to take their first spin around the rink…..
Will, John and Faith taking a short break…. This entry was posted in Uncategorized and tagged skating on December 23, 2013 by Becca.